The development of elevators has allowed major cities to become the massive and modern locations that they are presently. The introduction of elevators provided cities with the opportunity to build the tallest skyscrapers, hotels and high-rises in order to create a modern compact environment. Without the development of elevators, cities would look and function much differently than they currently do. Elevators were first introduced in the United States during the 1800’s. They were primarily built with the intention of providing a form of luxury for guests to move around in a hotel. It was soon discovered that elevators would be a great addition within commercial buildings to enable cities to grow. Elevators had a significant role in shaping how cities were formed in the past and continue to allow cities to grow and expand today. Elevators have become more advanced throughout history primarily with the creation of steel frames and electric powered elevators. With the increasing growth in construction of high-tech and green buildings, elevator technology has shifted to keep up with the ever changing modern buildings. According to the National Elevator Industry, there are approximately 900,000 elevators that are used within the United States. Each elevator transports 20,000 people each year resulting in a total of approximately 18 billion elevator trips per year. These statistics demonstrate how much individuals rely on using elevators as a form of transportation each day. By 2020, the smart elevator industry is expected to reach approximately $23 billion in its market. With the construction of modern high-rises, companies are looking to develop smart elevators to accommodate smart building designs. The market should expect an increase in the production of smart elevators due to developments of modern buildings, the rising standards of green infrastructure, and certain building requirements. Smart elevators offer many benefits to buildings due to their updated technology. They can provide a greater efficiency, quicker travel time and better performance especially for commercial buildings, healthcare facilities and residential apartments. There are several common issues that occur in elevator systems, but with the implementation of new technology these problems can easily be prevented. Some of the most frequent problems are the amount of energy that elevators consume and the long amount of time that people usually have to wait for an elevator. Utilizing software and energy efficient equipment can combat these particular issues. Mechanical problems with elevators can frequently occur due to system malfunctions or mechanical defects. In order to prevent mechanical issues from occurring, it is important for companies to create a carefully planned design. The American Society of Mechanical Engineers (ASME) has published a safety code document for elevator companies to follow. When designing a new product, companies should utilize certain design formulas, engineering tests and consider important aspects including load, stress and buffer supports. ThyssenKrupp Elevator Corporation (Thyssen) is a company that is involved with producing innovative elevators and escalators. Their unique MULTI elevator system was designed with magnetic technology enabling the operation of multiple elevators that are cableless allowing elevators to run in different directions. The technology is specifically known as magnetic levitation (maglev) which functions by implementing a magnetized coil along the elevator shaft which repels magnets located on the outside of the elevator. Power is transferred along the magnetic coils to guide the elevator in whichever direction it needs to go. Essentially, a magnetic field is located in the front of the elevator to pull it forward and in the back to push it ahead. This technology allows elevators to move in both vertical and horizontal pathways resulting in space for several cars to move around within the building. With the utilization of multiple elevator cars, individuals would have an average wait time of only 15-30 seconds. Maglev technology offers many benefits for large buildings and will change the way that future elevators are built. Thyssen has also introduced a new smart monitoring system, MAX, for their elevators. MAX is a cloud software system aimed to improve ride efficiency and keep track of any issues that may occur within the system. The software specifically utilized by MAX is Microsoft’s Azure cloud system, which gathers information by implemented sensors and systems. The data collected is sent to the cloud and used to determine what preventative maintenance should be conducted to solve any potential problems. Microsoft Azure’s software system offers predictive maintenance to the building therefore reducing the number of issues that occur to maintain an efficient and updated elevator system. While some engineers regard certain materials, for instance carbon fiber, essential for building taller towers, others believe that scrapping elevator cables altogether would serve as a better solution. In 2012, a company called MagneMotion unveiled a cableless elevator powered by a linear synchronous motor (LSM), akin to the maglev motors on some trains. MagneMotion’s elevator, developed for the U.S. Navy, is designed to move ammunition around a ship, but the company says it could easily adapt it for passengers. Unlike roped elevator designs, LSM technology is more efficient at higher speeds. More importantly, when commercial elevators are limited by length, capacity or environment, LSM elevators can have multiple cars in a shaft, reducing the number of shafts in a building and creating more rentable space. Without ropes, the hoistway can extend to any height, because there is no rope weight with which to contend. Additional benefits include lower maintenance costs, as LSM cableless elevators have fewer moving parts, as well as safety features that are designed to provide vehicle feedback control, anti-collision logic and redundant brakes. A future alternative that is being considered would provide horizontal motion of cabs between adjacent hoistways which would significantly increase the capacity of each hoistway with minimal added cost. 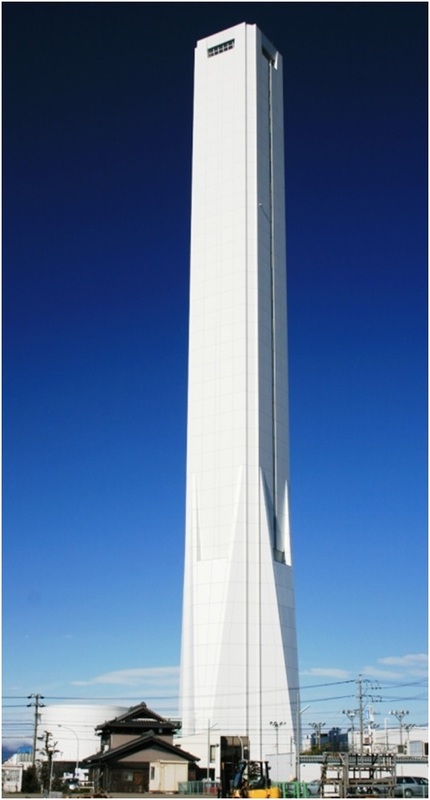 Mitsubishi built a test tower, SOLAE, which is used by the company to test high speed elevators. The tower is 567 feet tall and was built to flex in the wind just like high-rise buildings are built currently. The main testing elements that are tested by Mitsubishi’s R&D department are the drive performance, safety and riding comfort. This test tower allows the company to experiment with innovating and producing new products. 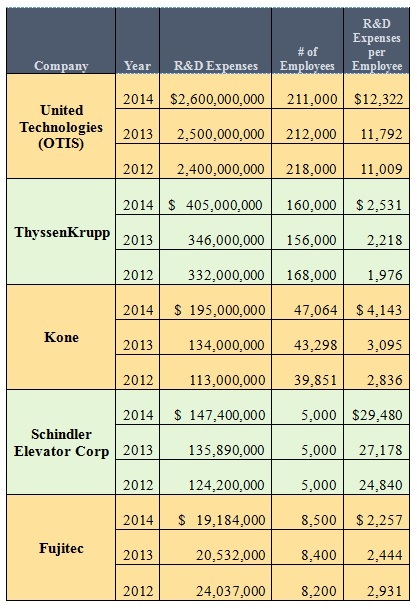 The Kone Corporation has been involved with the innovation of several forms of technology within the elevator industry. The company has invented elevators with modern technology, such as carbon fiber ropes and energy efficient motors. Kone’s UltraRope consists of carbon fiber that provides reliability while improving elevator performance. The UltraRope is created of light material and will allow elevators to move up a building of greater heights as skyscrapers are becoming increasingly taller. One of Kone’s products is an EcoDisc device which removes the need for a machine room resulting in the availability of more space in a building. The main elements of this technology are its green hoisting system, regenerative drive, eco-efficient car lighting and sleep mode. The green hoisting system features the combination of a magnetic motor, vector controlled drive system and other regenerative elements. The EcoDisc motor creates energy efficient buildings by implementing modern technology to reduce the amount of energy that would normally be consumed. Schindler Elevator Corporation has invested a large amount of their time and effort in producing a solar powered elevator. The net-zero solar elevator functions by ultimately utilizing solar panels and a battery bank. The elevator is powered from a 220 Volt, 6.2 kilowatt gearless electric motor and regenerative braking all of which provide a greater energy efficiency compared to a standard elevator. The elevator’s power can rely on solar power alone or can be connected to the grid. As an increasing amount of buildings are becoming energy efficient and following LEED standards, Schindler’s solar powered elevator provides a great option to implement within a building. The Otis Elevator Company is one of the largest companies involved in producing elevators, escalators and moving walkways. Otis Elevator became the company who was known for inventing the safety brake system for elevators ultimately changing the entire industry. The company was aware of the current issues with cable failures which caused numerous deaths when riding in an elevator. Otis wanted to create a solution to ensure individuals that elevators were a safe form of transportation. If cables were to fail, rather than an elevator falling all the way down the shaft it would drop a little and then be stopped by the safety brake. The invention of the safety brake ultimately changed the elevator industry leading to an increase in elevator use. Since inventing the safety brake, the Otis Elevator Company has kept busy working on new developments within the elevator industry. The company offers various products including observation, double-deck, sky lobby, freight and residential elevators, gearless traction electric elevators, geared traction elevators, hydraulic and machine room-less elevators. Otis’ Gen2 elevator incorporates three different technology devices, eCall, OneCall and eView, which provides a greater form of connectivity for individuals. eCall is a mobile application that allows people to retrieve an elevator in advance right from their smart device, which can reduce the amount of waiting time for an elevator. OneCall is a program located outside the entrance of an elevator where an individual types which floor they are headed to on a keyboard. eView is a display screen within the elevator that shows real time information including building updates, traffic information and weather. The development of smart elevators are increasing and will continue to do so within the future as companies keep up with our ever changing and modernized cities. The innovation of future elevators is likely to include taller, faster, energy efficient, cableless and multi-directional elevators. R&D tax credits are available for companies who are involved with the innovation of technology and software for the elevator industry.